There are nearly 100 city maintained parks. The Dowtown Park, the city’s crown jewel, recently reopened after a one year closure for a major upgrade. 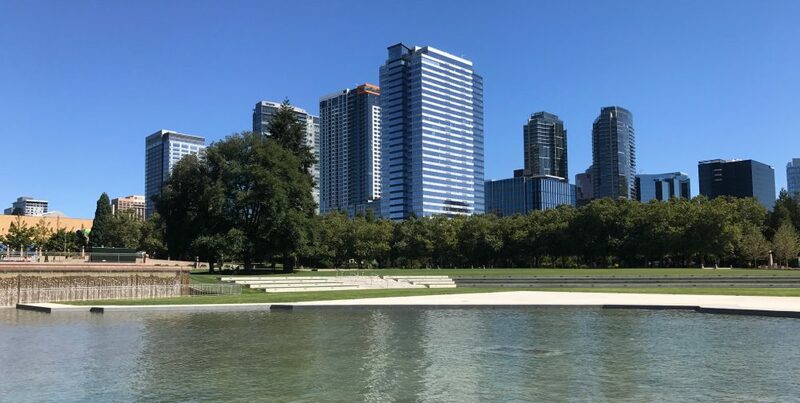 The park is a 21 acre oasis in the heart of downtown Bellevue offering views of Mt. Rainier and the downtown skyline. A 1/2 mile groomed promenade circles a canal which is bordered by trees and dozens of benches and a 240’waterfall. The expanded Inspiration Playground provides innovative play space for children of all ages and abilities plus a fun water play space which was very popular this summer. Nearly every community throughout the city has walk-able access to at least one park and many of the downtown office buildings have intimate public courtyards that offer a quiet respite in the city. I appreciate the time, care and maintenance city employees put into keeping our parks groomed, clean and planted with seasonal landscaping. Parks are a huge asset and contribute to the livability of a city and our local parks are a big part of what makes Bellevue s special place to live. This entry was posted in City of Bellevue, Downtown Park, lifestyle, livability, recreation and tagged BELLEVUE, golf, lifestyle, parks, recreation, tennis by Robin Myers. Bookmark the permalink.